Near the pipeline aid station on the JMTR after the storm on May 24. Photo is from Ed Santiago who posted this on the JMTR Facebook page. 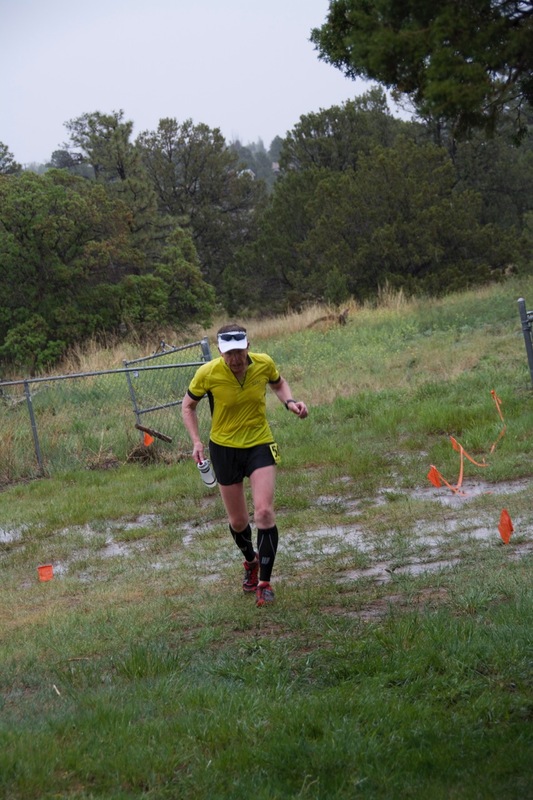 The 2014 edition of the Jemez Mountain Trail Run occurred on May 24 when the average high temperature in Los Alamos is 70 degrees and the low is 45 degrees. It rarely rains this late in May, and the expected weather for this date is “perfect”. 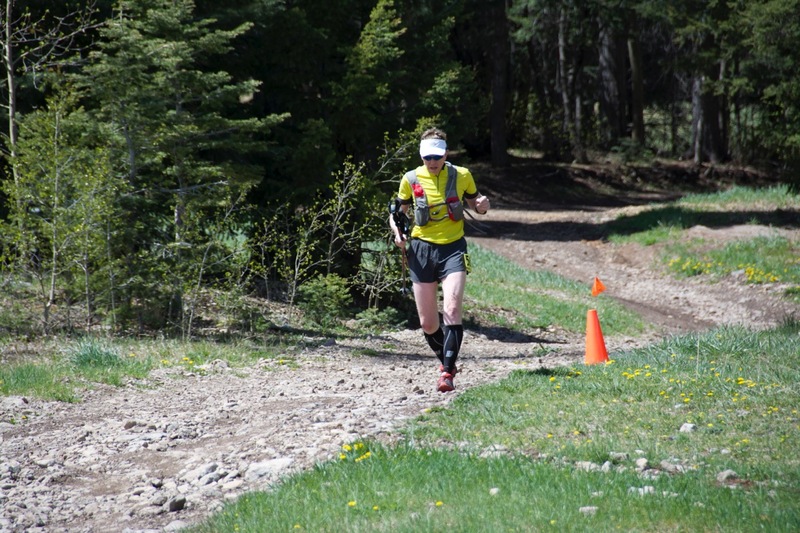 The JMTR is a tough race in the most perfect conditions – lots of elevation gain, and the race organizers always want the runners to get their monies worth so they have “long” courses; the 50k this year was just a tiny bit less than 33 miles instead of 31.07 miles. 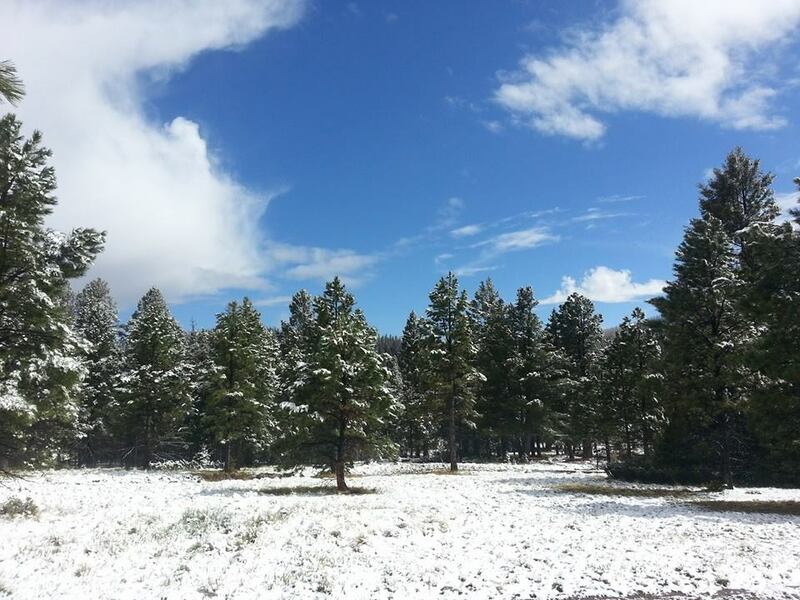 However, a strong weather system driven by a deep southern excursion of the jet stream drove a series of rain/snow storms across Northern New Mexico on Friday and Saturday (May 23 and 24), causing “imperfect” weather for the JMTR. 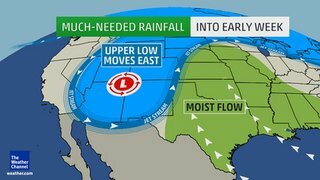 Jet Stream Dip, and the weather conditions for the southwest — perfect storm! The first wave of the storm swept through Los Alamos Thursday night and continued into Friday afternoon and evening. It dropped a about 2/3 of an inch of rain — much to the delight of the town residents that cringe at the thought of a hot, dry summer and the possibility of wildfires. Early in the morning of race day the weather looked exceptional – mostly sunny, cool, and the rain had removed the choking dust from the trail! There was a chance for rain in the afternoon, but that held the promise for a “cooling sprinkle” for the later stages of the 50 km and 50 mile rambles. A few minutes before the start of the 50 km race at 6 am. It was cool at the Posse Shack, but the promise was for a great day! Colleagues Dave Zerkle and Eric Martens. The JMTR in 2013 was hot — the temperatures in town got to a bit above 80 degrees by 2 pm, and the humidity was less than 10 percent. Those are tough race conditions, and I lost 7 pound during the race (which is inexcusable!) due to dehydration. So, needless to say, I was excited about the possibility of a super race with the cool temperatures this year. I had not trained as much as I would have liked due to extensive travel for work, but I felt good. The course for the 50 km was different this year. The Pajarito Canyon trail was a casualty of the 2000 Cerro Grande Fire that roared across the east Jemez and Los Alamos in 2000. The fire ended up burning 48,000 acres (and 400 homes in Los Alamos), and changed the landscape of the Jemez. Late in the fall of the 2013 the Pajarito Trail was rebuilt and provided a new pathway to climb Pajarito Mountain without trudging directly up the ski hill. 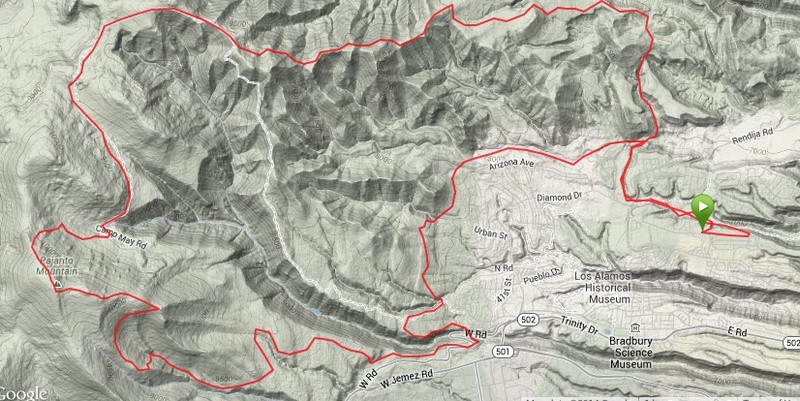 Route of the 2014 JMTR 50 km (from my Garmin, 32.97 miles, 6812 feet elevation gain). In the lower left hand side of the map is the new trail segment ascending the headwaters of Pajarito Canyon. The race started uneventful, but delightful. The race heads east out North Mesa before dipping in Bayo Canyon. Typically this trail is thick with dust, but the previous days’ rains had congealed the dust into a runner’s carpet. No clouds of dirt in the air, the first 10 miles were a runners dream. Mile 2 – wow this is fun! Beyond the mile 10 mark and the second aid station is the climb up Pajarito Mountain. This is 3000 feet of climbing over 7 miles. The new segment up Pajarito Canyon is beautiful, and easier than the ski hill….but it is very long. I chatted with many people on this section of the course, and they were wondering if the steady climb would ever end. Once you top out at Pajarito Mountain (10,440 feet) there is a 1000 foot descent over one mile to the Pajarito Ski Hill complex and the third aid station. I am also amazed with how slow the descent is for me – after the long climb my legs are not designed to run downhill. I arrive about 11 am, and the sun is shining – and I feel great! Coming into the ski hill aid station. At 11 am it is a perfect day! 18.6 miles done, and mostly downhill to the end. However, there are dark skies to west, and it is clear that some sort of storm is brewing. The skies are far more ominous than I would have expected from the weather forecast. I don’t really have any concerns for me finishing, but I fear for the 50 milers that will likely be caught in storm on their second ascent of Pajarito Mountain. It looks like thunderstorms to me — and no one wants to be above tree line with lightning. About 100 people die annually from lightning strikes (although most are golfers not runners…), and isolated high elevation ridges are much more likely to attract lightning than forested valleys. I did not really imagine that it could snow, but in hindsight the conditions were perfect for that. As I headed out towards aid station 4 at pipeline road the wind began to really pick up, and it was clear that some rain was on the way. The actual weather conditions for a station near my house in Los Alamos. You can see that the temperature began to plummet after noon, and the wind began to pick up. The top red line is the temperature, and it dropped from 62 degrees to 46 degrees over 3 hours. The yellow bars in the second panel show the wind speed, and the bottom panel is precipitation (aqua) and precipitation rate. The temperature on Pajarito mountain is usually about 10 degrees cooler than in Los Alamos, due to the difference in elevation. With a storm that has strong winds the temperature differential came be as high as 25 degrees. As I pulled out of aid station 4 there was some rain in the air – not much, but enough to know that the storm was serious. More importantly, the wind began to gust strongly. 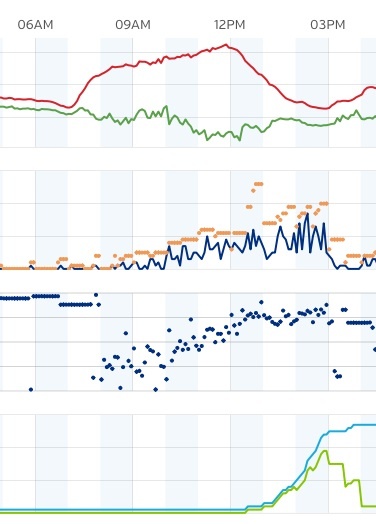 At the Los Alamos weather station there were gusts that topped out just about 30 miles per hour. It was much cooler descending the mountain down Guaje Ridge, although I attributed much of that to not working as hard as I was when I was climbing Pajarito Mountain. When you arrive at aid station 5 you are only 7 miles from the finish line. 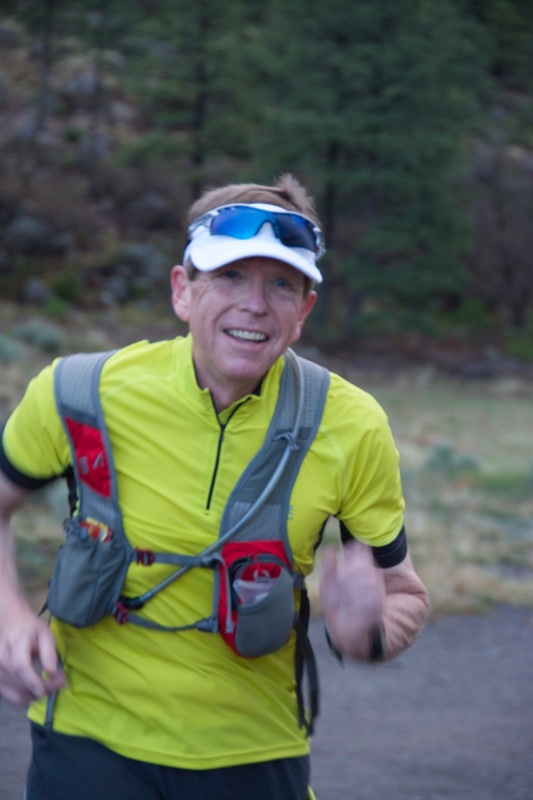 The aid station is at an elevation of 8800 feet, and that 7 miles means a drop of 1600 feet – a runner’s delight. However, it began to rain much harder on the descent, and I noticed that the front of my legs were bright red. There were not many people on the trail that I could see, although I was passed by a couple runners doing the 50 miler – and they were moving! The three people I did catch all were suffering from the weather. I stopped and talked to one fellow that was beginning to shiver. I was worried that he might not make it, but finally after a slow trot together I decided that he could probably get to the 6th aid station unassisted. Around mile 30 (not yet quite at the last aid station – station 6, where they always have pie!) I was having a little trouble running, or more correctly, stumbling. I attributed this to fatigue, but in hindsight it was the onset of mild hypothermia. My hands were cold, but there was only a couple of miles to go. The excitement (or, more accurately, the relief) of finishing carried me on. Climbing up out of Bayo Canyon back to the finish line I was soaked to the core and cold – and I noticed that all the volunteers at the finish were bundled up in nice warm rain jackets. I stumbled across the finish line, and thought I felt fine. The finish line. Cold, but I thought I was doing great! Once inside the Posse Shack I changed out of my wet shirt into a dry shirt and coat that my wife had brought me. I felt good, although I began to shiver. Within 10 minutes I was shivering uncontrollably, and had some trouble controlling my hands. At that point I realized that I had moderate hypothermia. Hypothermia occurs when the core body temperature drops below 98.6 degrees and normal bodily functions are interrupted. Mild hypothermia is basically shivering and what is called vasoconstriction – when blood flow is interrupted, so your finger tips turn blue and your exposed legs turn red. This interruption of blood flow causes a loss of muscle coordination, and slurred words and stumbling may happen. Recovery from mild hypothermia is not too difficult, as long as you are not exposed to the elements. Several warm cups of hot chocolate and a blanket from the EMT got me back into sorts. It seems strange that hypothermia is such a danger for runners – we are working hard, so we are producing heat. However, it is the loss of that heat with wet conditions that lowers the CORE temperature and leads to the danger. All in all, I enjoyed the JMTR 2014 — but I was lucky. Many of my colleagues got stuck on the mountain as the rain began to change to snow, and the temperatures dropped to freezing. 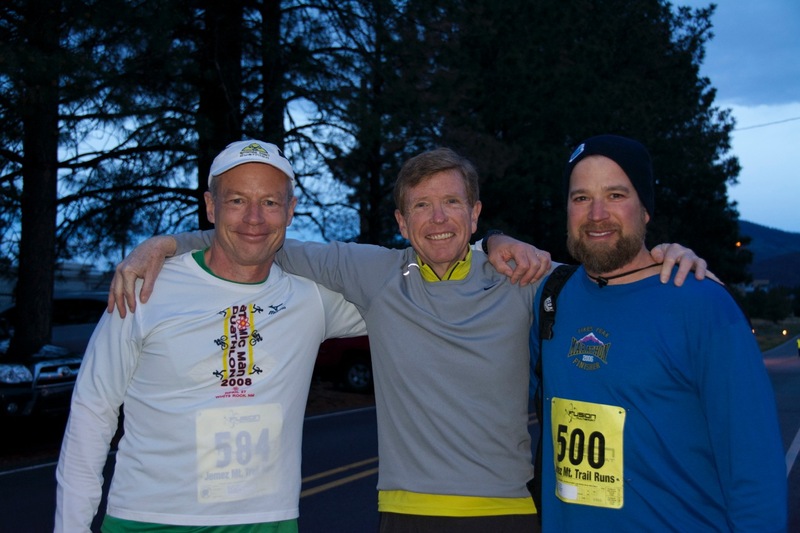 The race director eventually stopped the race, and pulled runners off the mountain. It had to be done. It is a mystery of nature that weather is highly changeable, and that humans can only operate efficiently within a narrow range of conditions. Trail running is more than distance – it is a battle with nature, the mountain, and the weather.